Hoyer Professional Access Sling is designed specifically to facilitate the toileting procedure by allowing the removal of clothing. This padded sling is durable, soft and comfortable that provides additional comfort and support to delicate areas. 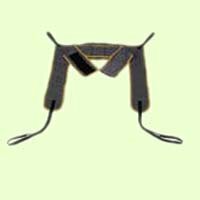 Residents must be in a sitting position to use this sling. This sling is to be used exclusively with Hoyer Advance lift. If you have any questions about this product by Joerns Healthcare, contact us by completing and submitting the form below. If you are looking for a specif part number, please include it with your message.